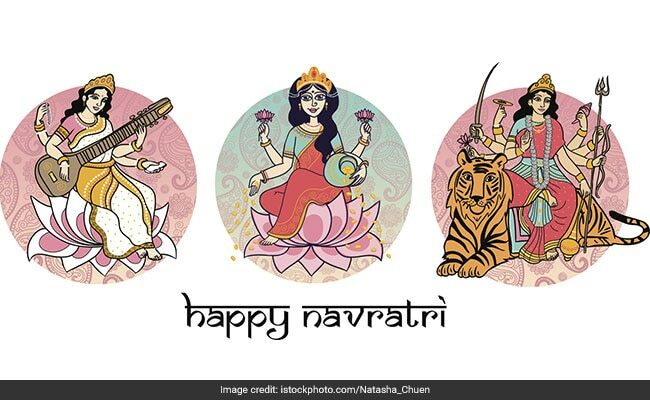 Chaitra Navratri 2019: Navratri dates are April 6 to April 14. Devotees across the country keep fasts and perform pooja during the course of the nine days when Goddess Shakti is worshipped. Navratri 2019: The nine forms of the Goddess Shakti are worshipped during the nine-day festival. NEW DELHI: Chaitra Navratri is a nine-day festival dedicated to nine forms of Goddess Shakti. Navratri begins on April 6 and ends on April 14. The nine forms of the Goddess –Shailputri, Chandraghata, Kushmanda, Skandamata, Katyayani , Kaalratri, Mahagauri, Siddhidaatri – are worshipped during Chaitra Navratri. Navratri festival is observed five times a year, the Navratri that falls during the month of Chaitra (March-April) is Chaitra Navratri. The other four are: Ashadha Navratri, Sharad Navratri, Paush Navratri and Magha Navaratri. Chaitra Navratri is also referred as Rama Navratri as Rama Navami, the birthday of Lord Rama, falls on the ninth day during Navratri festival. Chaitra Navratri is more popular in northern India. In Maharashtra, Chaitra Navratri begins withGudi Padwaand in Andhra Pradesh it begins with Ugadi. Devotees across the country keep fasts and perform pooja during the course of the nine days. They believe that it will help bring peace, prosperity and happiness in one’s life.The festival commemorates the coronation of Rama post his return to Ayodhya after completing 14 years of exile. On Mahashtami– the eighth day of theNavratri, kanya poojan/ kanjak poojan (worshipping of girls), is performed where signifying various forms of Goddess Durga. Mahanavami – the ninth day of Navratri, puja is performed and nine forms of the Goddess are worshipped. Some families also perform the kanya poojan on this day. Ghatasthapana Muhurta = 06:19 am to 10:26 am on April 6. The nine forms of Goddess Durga which are worshipped during Navratri are as follows:On the first day of Navratri, Shailputri is worshipped. On Mahashtami- the eighth day of the Navratri, kanya poojan/ kanjak poojan (worshipping of girls), is performed where signifying various forms of Goddess Durga.On Mahanavami – the ninth day of Navratri, puja is performed and nine forms of the Goddess are worshipped. Some families also perform the kanya poojan on this day.Fasting foods you can have during Navratri:During Navratri fasting time, a sattvik diet is preferred. Sabudana, kuttu or buckwheat, makhana, ragi, potatoes are some vrat favourites you can experiment with and make Kuttu Ki Poori (Buckwheat poori), Singhare Ka Halwa, Singhare Ke Pakore (Water caltrop is Singhara), Sabudana Vada and Sabudana (Sago) khichdi and other vrat foods. One can also opt for samang rice idli, samang rice dhokla, peanuts and paneer chaat, fruit raita, banana or mango milk shake, fruit smoothies, kheer, foxnuts with milk and fruit chaat. This entry was posted in HINDUISM, HINDUISM - News, INDIA, INDIA - News, LATEST NEWS, LATEST NEWS - News, WORLD, WORLD NEWS. Bookmark the permalink.